Are you ready for Osheaga yet? If you are, well good for you – if not, then read on. This article will prepare you in all things Osheaga. From where to stay, which bands to see, which after party to go to; it will all be covered here. By the way, this is our 2014 edition. Our new 2017 edition of this guide is HERE. You can definitely stay at “Hotel Osheaga” — several student residences (Maison Molson Canadian (Carrefour Sherbrooke), Bishop Mountain Hall, New Residence Hall, La Citadelle, or Royal Victoria College at McGill; UQAM Résidence Ouest at UQAM) and hotels (the Centre Sheraton Montréal or Montreal Marriott Chateau Champlain) located in the city run by the Osheaga people during the festival. All are within 15 minutes metro ride to the festival site and range in price from $475 to $1046 for 3-4 nights accommodation for 1 – 4 persons. This choice is perfect for those who like big hotels/ hostels and want to stay with hundreds of other Osheaga-goers. Some of the hotel packages include complimentary passes to the festival and all include wi-fi. On the Osheaga website, you can check out their hotel deals here. These packages are available for people who are 18 and up only, so if you’re under, you should look into some of the other options. These are not the only places that you can stay. You can also rent on Air BNB if you want to rent someone’s apartment for less than the average hotel room — some as cheap as $29 a night! You can also try staying at a hostel which is another more affordable option, starting at $20 a night in a dorm room. The m hostel (1245 Rue St-Andre) is well-regarded as the best (our article is HERE), but there are many others of all sizes. For those of you who are even more frivolous, you can always try couch surfing but you need to make an account and hope that your couch doesn’t bail on you. Note that there is no camping on the island. 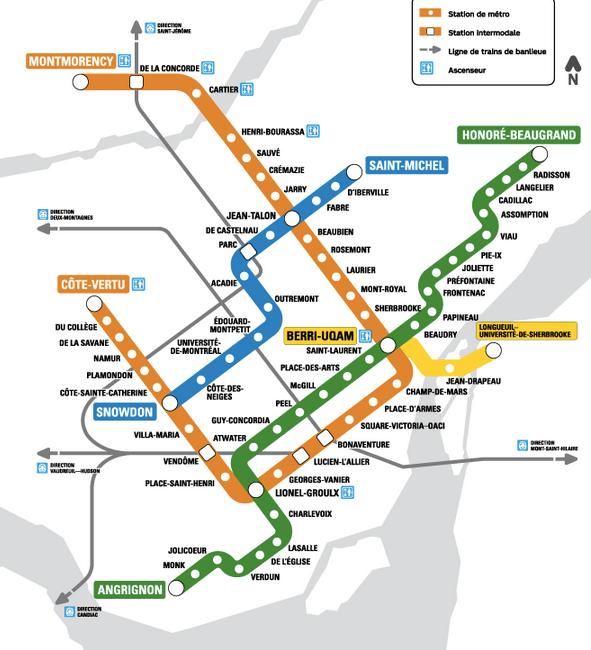 Take your bike or ride the metro to Parc Jean Drapeau on the yellow line (off the orange or green lines at Berri-UQAM station). Many hotel packages run by Osheaga include metro passes. The metro in Montreal is clean and safe. A single trip costs $3, a 3-day pass costs $18, and a weekend pass — the pass you’ll likely want — costs $13 (valid Friday 6 p.m. to Monday 5 a.m.). The single trip allows transfers between bus and metro for 120 minutes once activated by use, with some restrictions on transfers like you can’t use the same station twice or backtrack. The downside of the metro is that it only runs until 1 a.m. weekdays and Sundays, 1:30 a.m. on Saturdays; if staying out late, you might want to combine your metro pass with a Bixi bike late at night. Bixi bikes are a great way to get around the city and there are three stations set up at Parc Jean Drapeau during the summer — one near the metro stop, another near La Ronde, and a third near the beach. It costs $5 to be able to use the Bixi system for the day and it allows for a ride of up to 45 minutes for free. You can change bikes every 45 minutes and never get charged more than the initial $5 for the day! As a warning, though, the bikes cost $7 for each half hour after that initial free 45 minutes and the stations at Parc Jean Drapeau may be full. It might be necessary to locate an empty Bixi space off the island! Check docking availability using the Bixi application on a smartphone or their website. 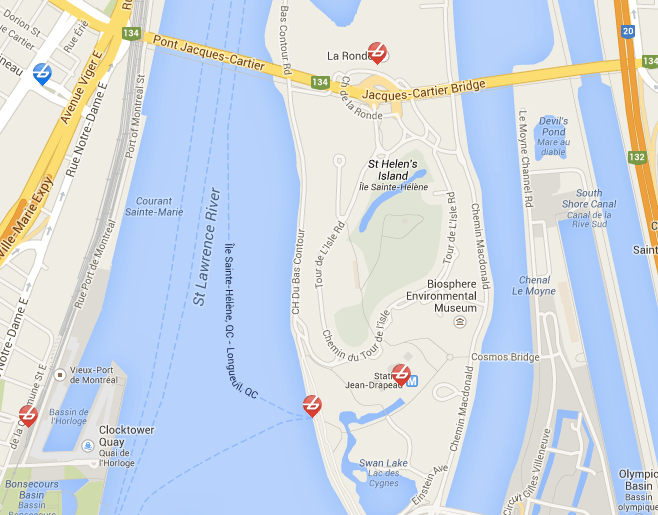 There is parking at Parc Jean Drapeau for $20 per day in the islands 15 lots. I am no fashionista, but there are a few key elements that one should not ignore when dressing for a music festival. First, check the weather. Second, check the weather AGAIN. Current predictions are sun and highs in the 30s, lows in the teens. Make sure that you are prepared for sun, rain, heat or chill. Whatever your outfit, be sure that you will be comfortable for the day. You’ll be doing a lot of standing and this will probably be in close proximity to other people. Next, I would have to say the most important thing to consider about your outfit is which shoes to wear. I am not the boss of you, but I strongly recommend wearing closed-toe shoes. You will definitely get dirty feet if you wear sandals, plus there is a high chance that your feet will get stepped on in the crowd. Another point to make is that the stages at Osheaga are spread far apart – and if you’re anything like me, you’ll want to get from stage to stage as quick as possible. Flip-flops aren’t the best for speedy movement. Finally, consider what kind of bag (if any) you want to bring. You’ll want to bring something that will get through bag check quickly and can hold essentials like a water bottle, sun screen, and a snack. Osheaga offers storage lockers for $15 a day to rent with all-day access. Toilets? Expect port-a-potties. Water refill stations are available at the site, so you can bring your own empty plastic water bottle to refill. Food can be purchased at the site or you can bring your own sandwich, drinks, and snacks (no coolers or bbqs though). Of course, alcoholic beverages are available, but you can’t bring your own in. For food, Montreal’s food trucks represent! They offer delicious, gourmet-ish variety at around $8-20 for a good-sized meal. Among the ones that are at the festival include Brit and Chips (fish and chips), ChuCha (vegeterian/glutan free), Roux (sandwiches), St Viateur (bagels) Le Belle Boeuf (smoked meat), Le Cheese Foodtruck (mac and cheese), Pas d’Cochon dans mon salon and Le Smoking BBQ (pulled pork), Nomad SOS (sausages), Gaufrabec (belgian waffles), and of course… POUTINE! Like any large music festival, Osheaga has after-parties off-site going on throughout the weekend. These parties feature DJ sets from artists that are playing during the day and sometimes regular performances as well. Of course, there is a fee to pay to get in to the after-parties but they are very entertaining. The full list of after parties and where to get tickets is here and includes Chromeo, Chvrches, Duke Dumont, Against Me, Tommy Kruise, Four Tet, and more. I will end this section with a warning, attending an after-party after a full day at the fest is not for the faint of heart. Each day at the fest can be draining, so if you plan on going to one make sure to stay hydrated and fed throughout the day. For unofficial after-parties, well, keep an eye on Twitter and Facebook. There are many amazing acts performing at this year’s festival, so it can be very hard to choose who to see. This is made even more difficult when two artists you like equally are playing at the same time. One way I tend to decide about this is considering the location of the stage and the performance I want to see afterwards. Without question Outkast is a must-see, even if you aren’t a huge fan these guys put on an amazing show and it is their last world tour EVER. Other bands I’m excited to see are Haim, Foster The People, Chromeo, and Bleachers. Luckily, you can make yourself a schedule here. And to help you go from stage to stage, the map has just been released.